I like to understand people. I like to create things. I love working in a startup. I did a PhD, then got bored with working in the lab and moved to creating software. I live in San Francisco with my husband. We go hiking, watch too many movies, and don’t listen to enough music. I am originally from India and think of both San Francisco and Delhi as home. I want to travel to South America next. I hate writing in the third person, but am not above doing it when needed. If I am speaking at your conference, grab bios and pics from here. Rashmi Sinha is a designer and entrepreneur. She is confounder & CEO for SlideShare, the best place to share your presentations on the web. Rashmi believes that good software comes from a true collaboration between developers and designers. Her background is social software & interface design. She did a Phd from Brown University and researched search engines & recommender systems at UC Berkeley. Deciding that she wanted to build products, she cofounded Uzanto which did design consulting during the day and built MindCanvas (online games meet online surveys) at night! Her appetite for products was whetted and SlideShare is her next venture. Rashmi blogs about the social web at http://www.rashmisinha.com. She speaks frequently at conferences like FOWA, SXSW & WebVisions. For her next career, she wants to write a book about strange things people do on social websites. 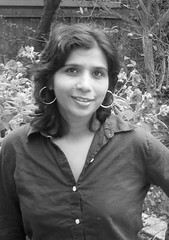 Rashmi Sinha is a designer, researcher and entrepreneur. Rashmi has a PhD in Cognitive NeuroPsychology from Brown University in 1998. After moving to UC Berkeley for a PostDoc, she fell in love with the web, and realized that many issues that web technologists think about are problems of human psychology. She worked on search interfaces & recommender systems but Information School. Deciding that she enjoyed practical problems more, she co-founded Uzanto, a user experience consulting company and worked on projects for companies like eBay, Blue Shield, AAA etc. Her first foray into products was with MindCanvas (a game-like software for customer research) released in November 2005. 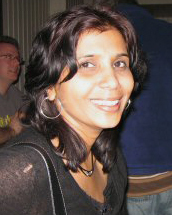 Rashmi writes about social software and entrepreneurship at her blog – http://www.rashmisinha.com. She is involved in the HCI community, was one of the founding members of the Information Architecture Society, and co-chairs the monthly BayCHI talk series. At SlideShare, she focuses on design, community and business. If you really want her attention, then post a comment on her slidespace! Nice to meet you, it seems you are doing great over there. Great going, keep rocking.